Main Gates $3000: For all 3 afternoon / evenings of the Event, Friday 8th June from 5pm, and Saturday 9th & Sunday 10th from 4pm. Attach wristbands to all patrons over the age of 18years that have provided Photo ID. This must be manned by a minimum of 4 volunteers from opening of venue each day until 8pm, then a minimum of 2 volunteers from 8pm til 11.30pm. Marquee’s & Parameter Fence Set-up & Dismantle $3000: For set-up of Parameter Fences on Thursday 7th June from 3pm, and dismantle of Parameter Fences on Monday 11th June from 8am, approx 8-10 physically fit volunteers are required. Set-up of Marquees on Friday 8th June from 8am, and dismantle on Monday 11th June will require 6-8 physically fit volunteers. Cleaning of / and restocking of supplies to Toilets and Emptying of Rubbish Bins on Grounds $4000: For all 3 afternoon / evenings of the Event, starting from 5pm Friday 8th, and 4pm Saturday 9th & Sunday 10th. Requires at least one female and one male volunteer, to be able to access all toilet facilities to clean stocks and clean amenities. All stock & product is supplied by WFC. Emptying of Rubbish Bins on Grounds during the 3 day Event, this will require minimum of 2 physically fit volunteers to check grounds every 1 – 2 hours and empty full wheelie bins into skip bins provided. Grounds Clean-up $3000: For Saturday 9th, Sunday 10th & Monday 11th, approx 6-8 volunteers to remove all rubbish from the grounds, into the skips provided. As the grounds are School Grounds used by children it is imperative that this task is performed thoroughly for safety purposes. The start time for this task can be determined by the successful Community Group undertaking it, and times are to be communicated to the WFC Committee prior to entering the grounds. TO APPLY PLEASE EMAIL YOUR INTEREST TO: weipafishingclassic@gmail.com with COMMUNITY ASSISTANCE as the subject line. 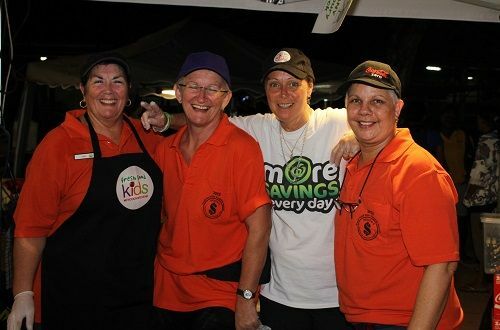 The Weipa Fishing Classic is the Cape York’s largest community event with approximately $150,000 given back to our community over the past 6 years. Each year, business and community groups embrace the event by sponsoring, volunteering or getting in the various activities, stalls and exhibits. The annual Fishing Classic is a great opportunity for local community and sporting groups to raise much needed funds. Please contact us to secure your fundraising opportunity.